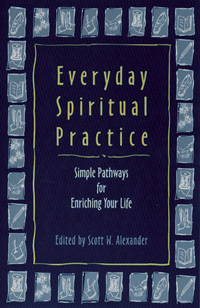 Have you wondered how to integrate your heartfelt beliefs into your daily life? Here nearly 40 contributors ponder this creative dilemma and share their discoveries. Creating a home altar, practicing martial arts, fasting, quilting — these are just some of the ways they've found to make every day more meaningful and satisfying. Deep in our innermost core we yearn to be connected with the mystery we call god, or nature, or the spirit. We yearn for that sense of oneness with each other and all creation, to know our place and our value. And, often, we yearn for someone to show us how to get there, to direct us to the right path that will lead us on the way to a deeper spirituality. The problem is, finding the right path is like standing in front of a candy counter and trying to decide which piece is the right piece, the best piece. You know that it all depends on your tastes, and you need to know what you like in order to choose the best piece for you. That means that you have to have tried at least some of them to know which ones you like. Even then, it’s important to acknowledge that others may find different pieces more to their liking. There is no one right path to a deeper spirituality. There are many right paths, and the one you choose may serve for a while, and then need to be changed over time. Like the Buddha who left everything to go off in search of enlightenment, you may find yourself coming back to yourself in the end, as did he, to your own home and people, to a greater understanding of the value of the mundane alongside the spiritual, and the importance of learning to balance your life. My daily spiritual practice is to balance. A major part of that practice involves balancing the busy, taking-for-granted moments of the day with moments to pause and appreciate what is before me in my life. I probably wouldn’t even have considered this a spiritual practice, except that I’ve been learning to redefine the meaning of what is spiritual, and to ponder for myself what is important in my faith.